THE COMPUTER SCIENCE DEPARTMENT OPEN DAY was the culmination of a busy week of lectures and seminars, attended by people from all over the world. Today, the public were welcomed into the Computer Science building, and both staff and students were on hand to give demonstrations and and answer questions on the many fascinating areas of work currently in progress at the Department of Computer Science. Displays and demos ranged through Animation, the Baby on video, Cabling and Network, CASWEB, COMBAL, COPAC, CDV Dalen, Establishing a Web Site, GMING, INTRA Project, ISDN Video Conferences, Linux, Medical Visualization, Visualization of Global Climate Data, Visualisation of Chemistry, Thin Client, Web Caching, Year 2000 and many others. The entrance lobby was full of visitors, staff and students, and many different types of machine were on display. Through the door to the right was the computer cluster - a room full of networked computers, normally used by staff and students. But today, the public were able to use the facilities and most of them were surfing the Internet. In another area, the University's high power machines, kept in a temperature controlled and dust-free environment, were visible through a glass partition - real science fiction stuff! With my special interest in computer imaging, the display which impressed me most was the demonstration of Virtual Reality, given upstairs by the Advanced Interfaces Group. It had already attracted a large number of spectators over the previous two days, and this was the very last show. Everyone was loaned a pair of cardboard stereo glasses. There was a projected diagram of a molecule on a large screen in front of us. When you put the glasses on, the molecule suddently jumped out from the screen in three dimensions. The image came from two video projectors mounted at the rear of the room. Using polarising filters on the projector lenses and stereo glasses, the left eye sees only the left image and the right eye sees only the right image. The first display was a virtual reality model of a gas compression platform built in the North Sea by Conoco. The detail and complexity of the model was astounding. An operator at the computer used a mouse to "walk" around the rig. In stereo 3D, you really feel like you could reach out and grab the hand rail. A computer model like this can save millions of pounds in development costs, and can also be used by maintenance teams to familiarise themselves with an unmanned installation before going in to repair it. The next item was a simluated model of the interior of the Computer Science building. 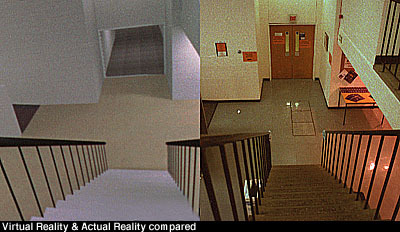 The image quality was extremely good, due in part to the use of a special radiosity technique to simulate lighting effects. The detail and textures were amazingly realistic. An extremely powerful Silicon Graphics computer, lent to the AIG for the occasion, gave us a very smooth and jump-free simulation. Running down corridors, up stairways, through doorways and into rooms, it was a bit like playing "Doom" but without the violence. Amazingly, this simulation has been developed in co-operation with Greater Manchester Police. They will use it not to practice chasing criminals, but to recreate crime scenes with all the dimensions and spatial relationships correct, helping them to determine things like bullet trajectories, and other forensic data. The VR model looks cleaner and more spartan than the real thing. Certain details, such as lights and wood fittings are different. It also lacks the furniture and the people of the actual scene. I'm told the furniture will be added soon. The people will take longer to arrive! The drinks machines shouldn't be too difficult to simulate - and what about virtual cans of Pepsi paid for using virtual coins! The doors are currently missing from the computer simulation, based on architects CAD drawings and on data gathered and input by the AIG team. The simulated lighting is particularly impressive, and takes a lot of complex software and heavy duty processor power to achieve. The third feature was a "Virtual City" seen from ground level. It looked like an almost deserted Miami Beach or Abu Dhabi - full of big white buildings, empty roads and open grass, populated only by "avatars" simplified human-like forms that can do simple actions such as walking and elementary limb movements. The interesting thing about this virtual city is that it was designed by a computer: Using general data about the layout of cities, it generated a city according to the rules it had learnt. Also, the avatars are controlled by a separate program and move independently of the main program. This virtual city was part funded by EU money and is only an early stage of development. 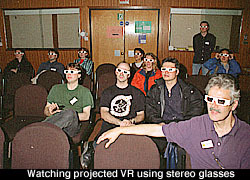 We removed the stereo glasses for the fourth and final demo, which featured two points of view and a "world within a world". First we saw an office with two "avatars" standing in it, and on another screen, the same room but from a different point of view: through the "virtual" eyes of the avatar. In this way, two or more operators can interact with the virtual environment, each controlling an avatar of their own. One of the AIG team demonstrated how you can manipulate objects within the virtual world using hand-held 3D mice sensitive to position and movement. He "picked up" a computer in the virtual scene and moved it around in space, changing its shape and letting it hang in mid-air. But putting it down on a table proved difficult - it passed through the table and disappeared! The program still has to be taught certain basic rules of the universe: That solid objects can't be merged into each other, and that they are always pulled downwards by gravity when you let them go! Another feature of this VR environment was a cube with goldfish in the middle of the room. The goldfish stayed inside the cube as long as a condition in the program was maintained in the "on" position, but when this was switched "off", the goldfish started swimming around the room. Then the human-size avatar was shrunk down to "Tom Thumb" size and "imprisoned" inside the cube. Despite frantic leg and arm movements, he didn't succeed in escaping until the operator changed a setting on the program and let him out! It was mind-boggling stuff, and after half an hour of it, you feel quite glad to return back into the real world again! I'm sure that in a few years time, what I saw today will seem very elementary. 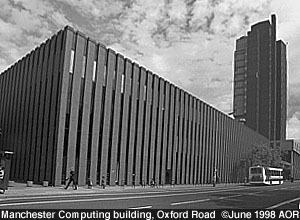 Who knows maybe soon you'll be able to enter, walk around and attend lectures at a virtual Manchester University campus, all the time sitting at your computer in Australia, America or Ashton-under-Lyne! Many thanks to research assistant Jon Cook for giving me extra information and demonstrations. Visit the Advanced Interfaces Group web pages at http://www.cs.man.ac.uk/aig/.